Innovation Distinguishes Mountain View's New Parking Garage. The new stand-alone parking structure is a 164,200 square-foot, 4-story, 5-level parking garage with 415 stalls. The ground floor includes 14,000 square-feet of retail space and is home to a CVS Pharmacy. 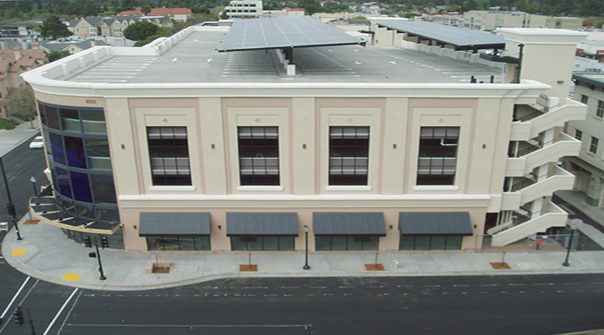 Photovoltaic panels were installed on the roof which produces all the energy needed to run the garage and the retail space. This system greatly reduces the operating costs for the City of Mountain View. At the California & Bryant corner the public art is a 3-level design titled ‘Sun Rising From Sea’ by San Francisco-based artist Shan Shan Sheng. The artwork consists of nine panes of glass, each 10 ft. tall by 6 ft. wide. The architectural glass is fused with layers of mineral paint then melted in a large kiln in Germany. Each pane took about two months to create. The vibrant reds and blues above the retail space will mark the garage as a gateway to downtown.